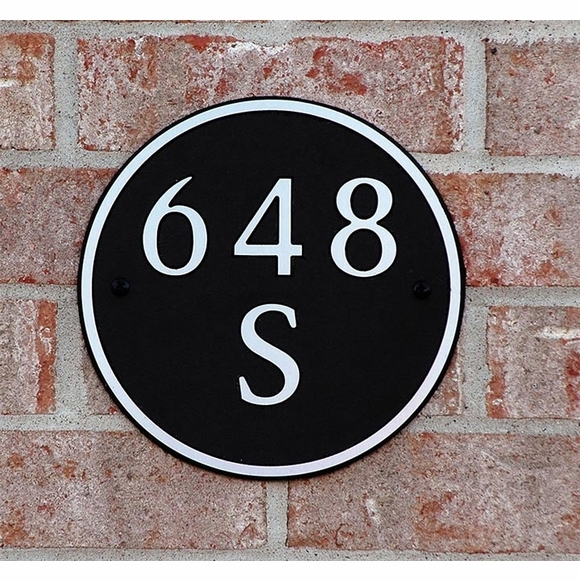 Circle House Number Sign - - Personalized address plaque holds one or two lines of text. Made in USA. Round address plaque comes in three sizes: 8" diameter, 12" diameter, or 16" diameter. The 8" plaque holds up to 3 characters on line 1 and 1 character on line 2. The 12" plaque holds up to 7 characters on each line. The 16" plaque holds up to 14 characters on each line. If you are ordering a one-line address sign, please leave the Line 2 input box empty. Round address plaque holds one or two lines of personalization.